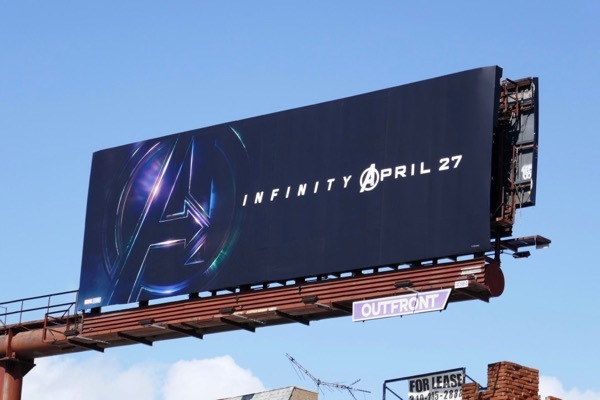 This April Earth's mightiest heroes assemble for a third time on the big screen, but this time they're not alone as they are joined by the Guardians of the Galaxy, the technology-advanced nation of Wakanda, the best mystics the Marvel Cinematic Universe have to offer and a friendly neighbourhood 'Spider-man'. 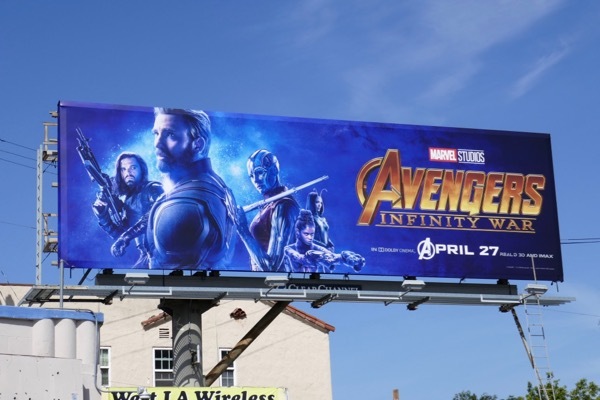 Finally after being teased for years in previous Marvel Studios movies, the villainous 'Thanos' makes his presence felt along with his 'Black Order' and the planet's heroes will need all the help they can get from home, and beyond, in Avengers: Infinity War. 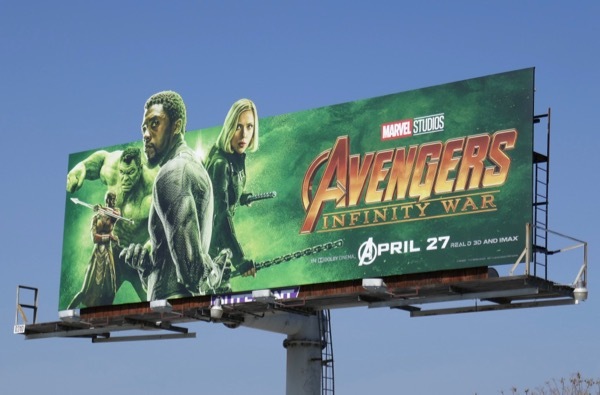 Having been divided in Captain America: Civil War, it's time for the Avengers to put aside their differences and unite against this deadly alien threat that wants to use the six 'Infinity Stones' to control the universe. 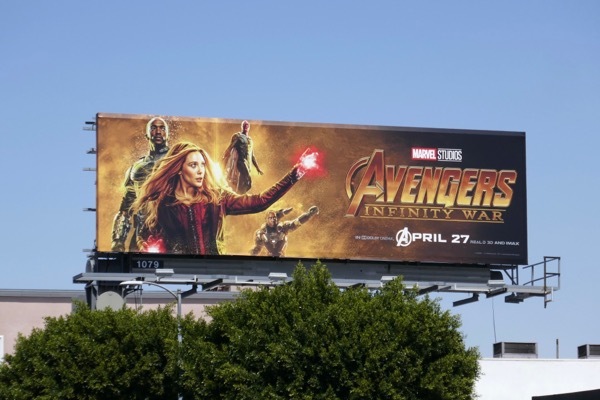 Original members, 'Iron Man', 'Captain America', 'Black Widow', 'Thor' and 'Hulk' are all there along with newer Avengers, 'Falcon', 'Vision', Scarlet Witch' and 'War Machine', plus they're joined in the fight by Sorcerer Supreme 'Doctor Strange' and 'Wong' and fresh from the success of their box office smash 'Black Panther' and the proud Wakandan warrior women, 'Okoye' and 'Shuri'. 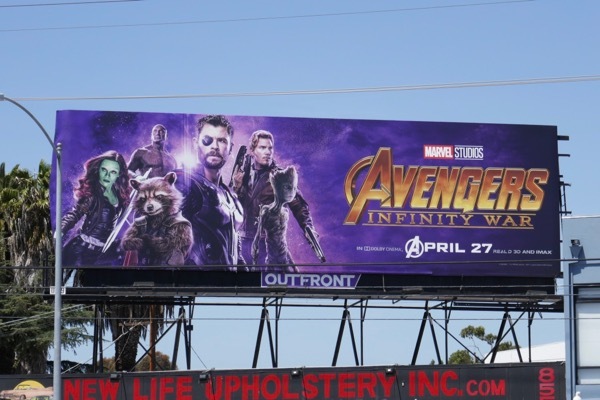 From the depths of space the God of Thunder brings along 'Star-Lord' to help save his home planet with 'Drax', 'Rocket', 'Groot' and 'Mantis', plus 'Gamora' and 'Nebula' who have an axe to grind with their warlord adopted father, Thanos. 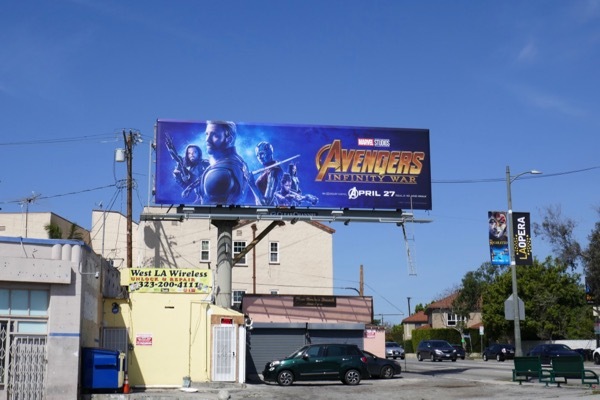 This movie spectacular has everything but the kitchen sink, but where's 'Hawkeye' in these outdoor ads. He's conspicuous by his absence. Is he officially retired, or is he on some top secret mission to help save the day. 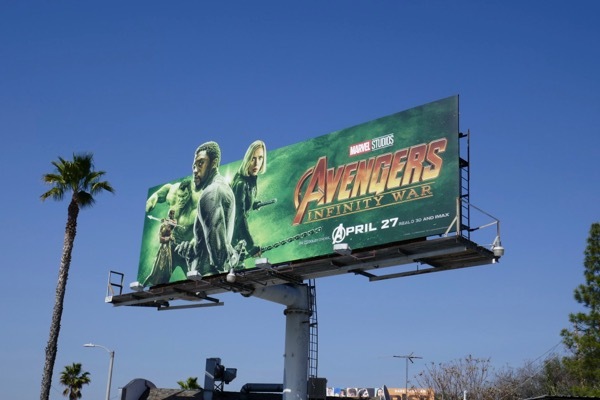 Also will the astonishing 'Ant-Man' and the 'Wasp' feature in this movie, or the fourth Avengers installment? 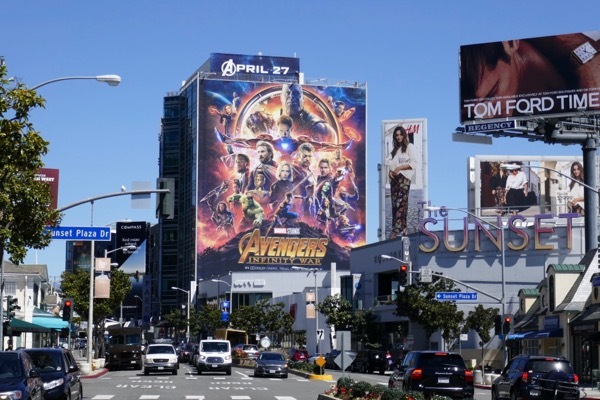 The Avengers Infinity logo teaser billboard was first spied along Santa Monica Boulevard on March 15, whilst the jam-packed giant-sized theatrical version was snapped towering over the Sunset Strip on March 27, 2018. 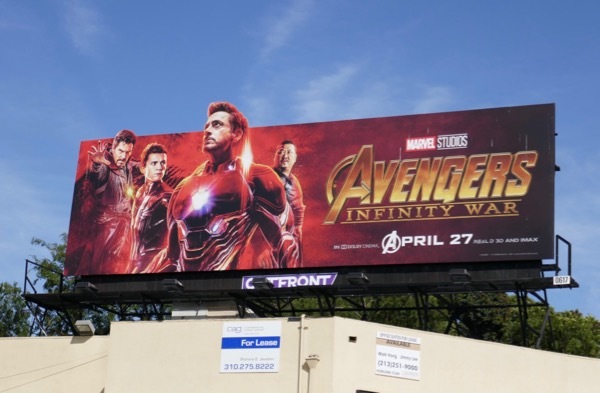 The other team-up landscape billboards which feature interesting combinations of characters, were spotted along Ventura Boulevard, Cahuenga Boulevard, Santa Monica Boulevard, La Brea Avenue and Venice Boulevard from April 4 to 9, 2018. 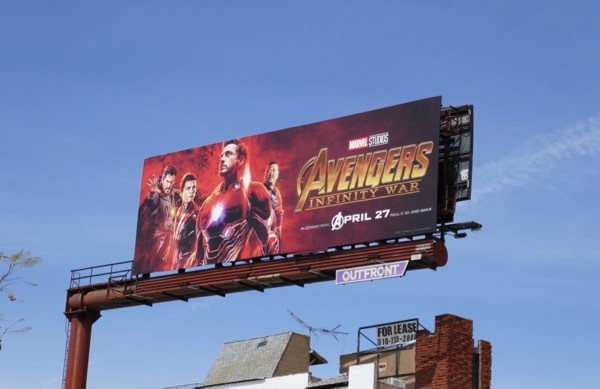 Fans of Marvel's mighty assemblage can also enjoy these previous Avengers movie billboards, these Iron Man movie billboards, these Captain America movie billboards, these Thor movie billboards, these Doctor Strange movie billboards and these Guardians of the Galaxy movie billboards. 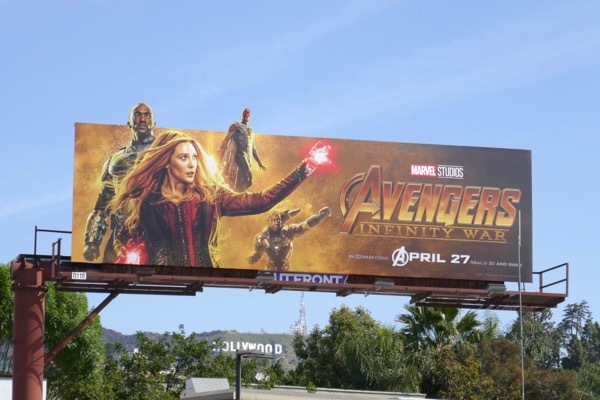 From these billboards it looks like War Machine is back in action after being injured in Civil War, but can Vison and Scarlet Witch survive this experience after receiving their lives and powers from the 'Mind Stone'. 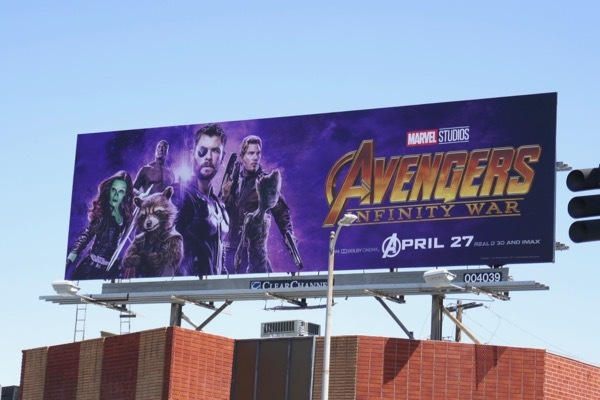 Thor lost an eye battling 'Hela' in Ragnarok, but will this mighty band lose more before this epic cosmic battle is over? 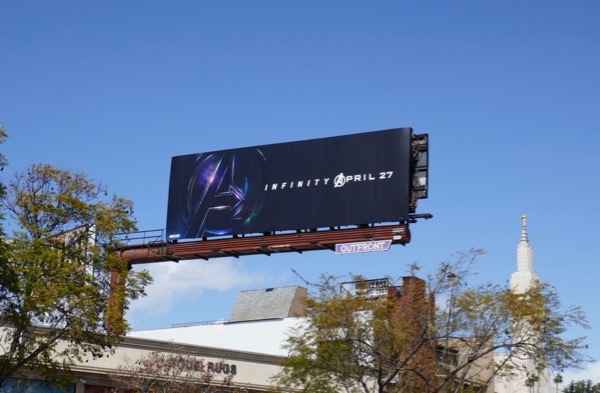 Will magic, youthful enthusiasm,Wakandan science and new armour be enough to save Earth from these galactic forces of evil? 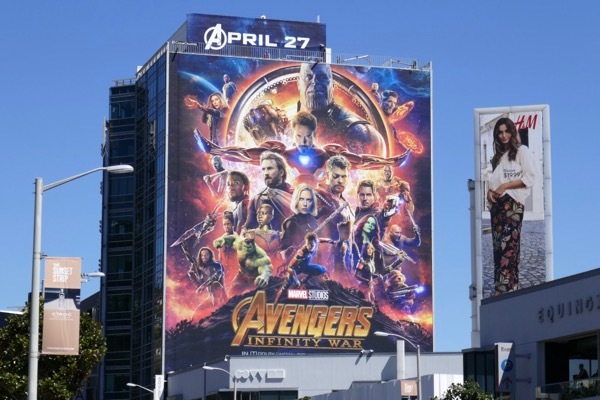 You know, a few casualties of war would make it easier to fit all these superheroes onto a poster for the next Avengers movie. Just saying. 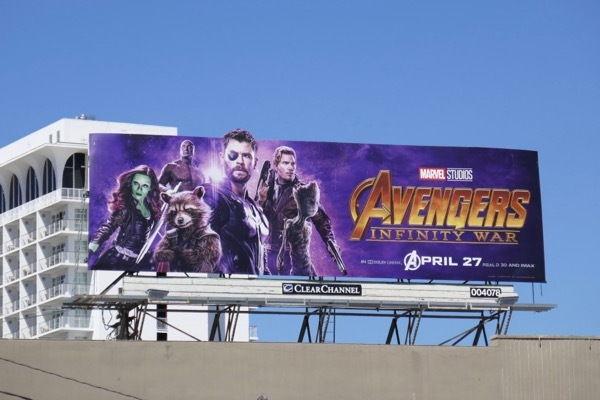 UPDATED: Here's also a special extension cut-out for the Thor and Guardians of the Galaxy version spotted along Pico Boulevard on April 17, 2018. 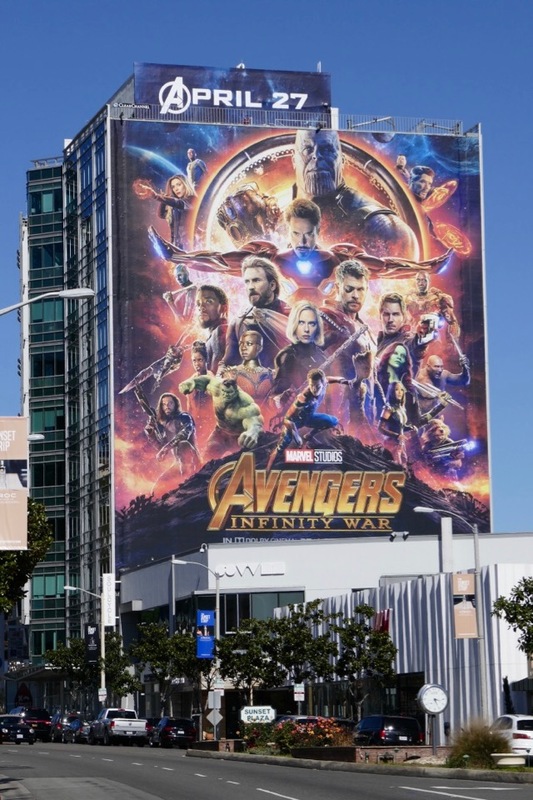 And fans of the epic blockbuster can also check out all these cool original costumes from Avengers: Infinity War on display.